The Foreign Minister of Yemen has rejected peace talks called for by the country’s former President Ali Abdullah Saleh. This comes as a Saudi-led coalition continues to carry out a military operation against Shia Houthi rebels and Saleh loyalists. "These calls [for peace talks] are unacceptable after all of the destruction Ali Abdullah Saleh has caused," the Foreign Minister Riyadh Yaseen said at a news conference in London, adding: "There can be no place for Saleh in any future political talks." This was a response to Saleh's call on Friday for all Yemenis to return to political dialogue in order to stop the conflict ravaging the country. He was speaking after a day of some of the most widespread violence across Yemen. 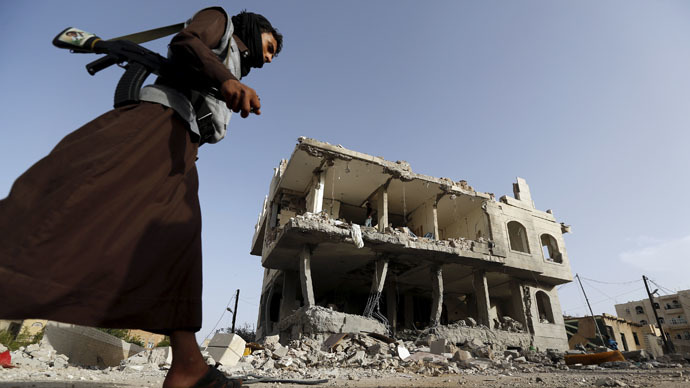 The Saudi Air Force undertook several bombing runs, including at least five in the capital, Sanaa, hitting an area near the presidential palace. Meanwhile, warships belonging to the Saudi-led coalition have been shelling rebel positions in the key port city of Aden. In the central Marib province, which was also hit by airstrikes, ground clashes broke out between pro-Saleh forces and local tribesmen. In the city of Taiz, fighters backing the President Abd Rabbuh Mansur Hadi, who is currently in exile, have made gains against the Shia Houthi rebels. In the southern province of Dalea, Hadi supporters say they seized several rural districts from the Houthis after hours of fighting. The Saudi-led military campaign has been going on for a month now. The latest estimates put the civilian death toll at 550 people, 115 of which are children. The campaign targets Houthi rebels and supporters of Yemen's former President Ali Abdullah Saleh, after they ousted the current President Hadi and forced him into hiding in Saudi Arabia. On Tuesday, Saudi Arabia said the first phase of the campaign, codenamed operation "Decisive Storm", had achieved all of its goals and was concluded. The new phase, operation "Restoring Hope", was announced with a focus on diplomacy, but didn't rule out new airstrikes.